I intentionally did not mention the craziness that has been going on here in Lexington for the past few weeks. I didn't want to jinx it. I am not a sports fan but it was impossible not to get caught up in the excitement of UK's basketball championship. I did try to talk my 80 year old neighbors into dragging their couch out into the street and setting it on fire but no such luck. We've gone from basketball craziness to horse racing craziness. Today is the first day of Keeneland's season (the local racetrack) and then it is Derby. Kentucky is an interesting place to live in the spring. I suddenly realized this week that I had not started the handouts for the course in Mackinac yet. Since I promised to do a very complete handout for the students which will can be used as a finishing reference guide, I thought maybe I should start it. I'm devoting my mornings to it. So far it is coming along very well. I am knitting the samples for the handout with very large needles so you can clearly see the stitches. I'm debating about including samples of how NOT to do things....Sometimes that can backfire! Another fairly slow week. All of the lessons I reviewed this week came on one day. It it my policy to review lessons the day I get them so that was a busy day. This tip is a continuation of last week's tip. If you haven't looked at it you may want to scroll down and read it first. 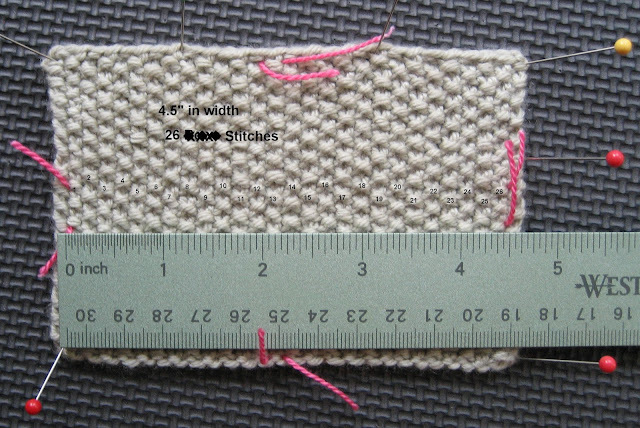 Once you have completed your gauge swatch and marked the width and length in the center, you are ready to take the measurements. Most knitters measure gauge by placing a ruler on a swatch and counting the stitches and rows. This method does not always provide accurate results. In the Masters Program we measure gauge in a very specific way. Measure the width and length within the markers to the closest eighth of an inch. Write down the measurement converting it to a decimal (1/8 = .125, 1/4 = .25, 3/8 = .375, 1/2 = .5, 5/8 = .625, 3/4 = .75, 7/8= .875). Count the rows and stitches within the markers and write down these numbers. 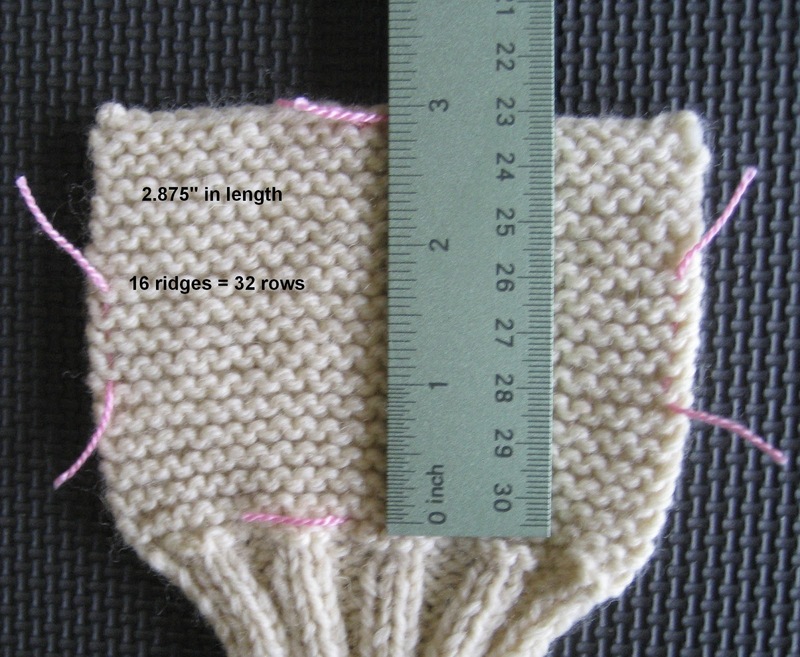 Your gauge calculations will only be as accurate as your measurements and your stitch and row counts. If those numbers are wrong, so will your gauge calculations. (Next week's tip will be about the calculations.) By the way, I am a complete MATH IDIOT and if I can do this, ANYONE can. For years, my gauge calculations involved casting on 10 stitches and working 4 rows and a tape measure which was older than me. You won't be surprised to find out that I frequently had to rip out 4 inches of knitting and start again. When I started designing, I starting taking gauge seriously as I didn't have the luxury of redoing things. The photographs which follow are pretty self-explanatory. I have provided photographs with the measurements and stitch/row counts. When you measure, always use a metal or wooden ruler. They don't stretch out. Place the swatch on a flat surface. If it is a slippery fiber, you may want to pin it in place. It can be tricky to count garter stitches. Remember, the "frown" is the stitch, the "smile" is the space between stitches. Garter stitch rows are easy to count. Each ridge is two rows. Just count the ridges and multiply by two. I didn't bother to mark them. "/\". I cannot stress how important it is that you recognize the difference, not just for gauge but for finishing. By the way, I apologize for the strikeouts. I didn't notice I'd labeled as "Rows" until I'd saved the changes. I just couldn't face redoing it! I've numbered the rows as well. What I do when I am counting rows is to use a tapestry needle and insert it into the center of each stitch as I count it. At least I am consistent with my mistakes! 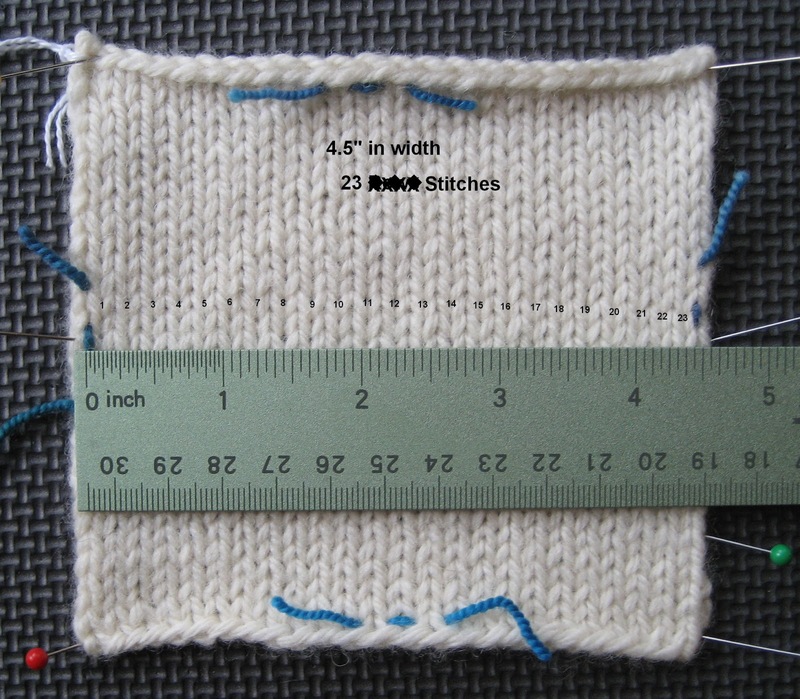 It is easier to count the number of stitches in seed stitch. The columns are easy to see. 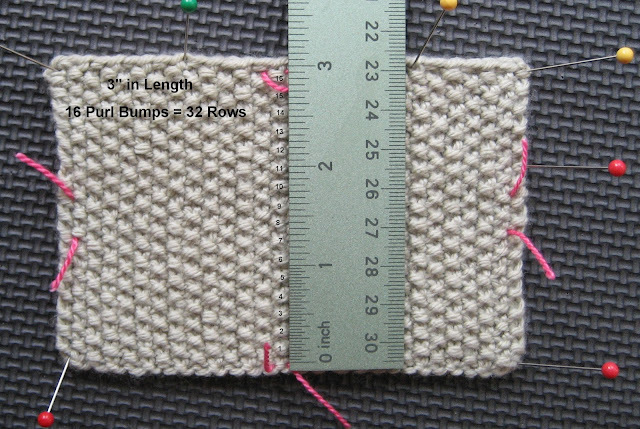 It isn't hard to count rows in seed stitch if you mark it carefully. Place the marker at the lower edge below the knit stitch and place the marker at the top above the purl bump. Then you can count the purl bumps and as with garter stitch, multiply it by two. 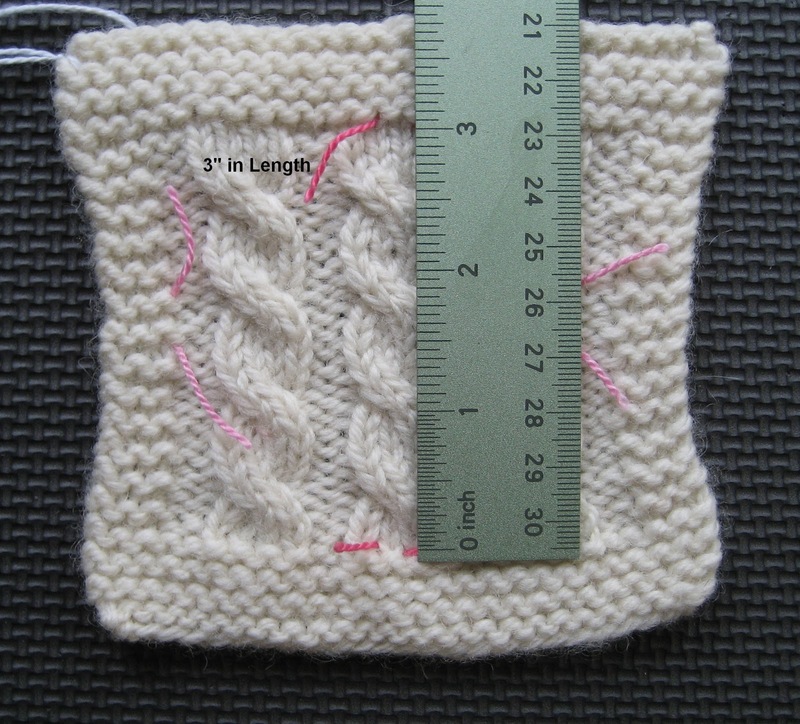 Counting stitches in cable patterns can be difficult. It is much easier to count pattern multiples. 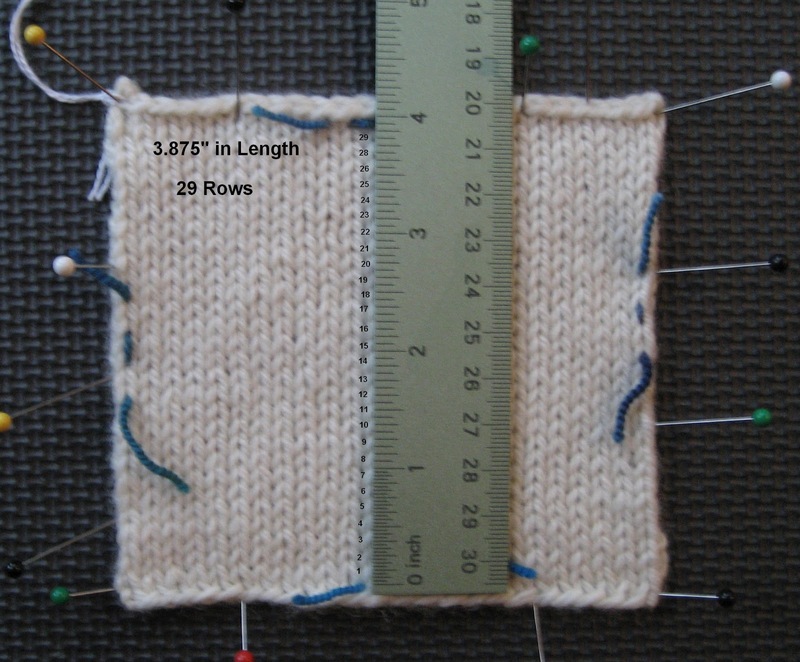 If counting stitches in cable patterns is difficult, it is almost impossible to count the rows. 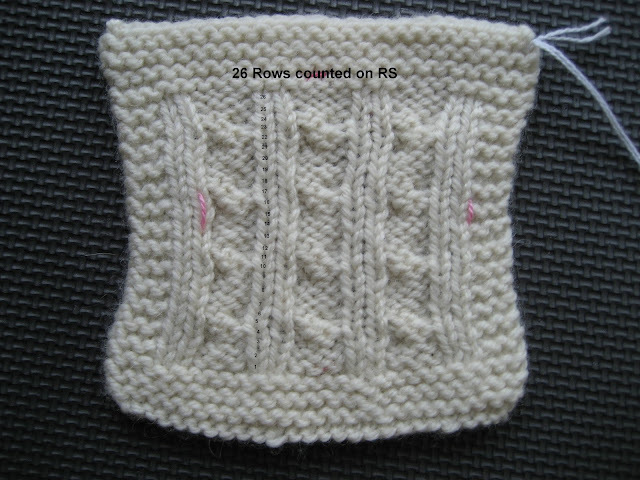 It is easier to count the reverse stockinette stitches between the cables. 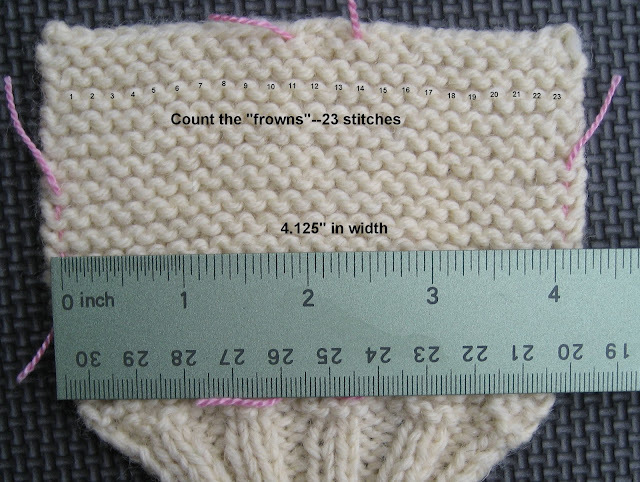 You can always turn the swatch over and count the stockinette stitches if that is easier. When you are working gauge swatches, you can save yourself time if you carefully note the number of stitches and rows as you work them. Remember, to subtract selvedge stitches and cast on and bind off rows in your counts. Next week we will do the gauge calculations. Salon will be on Sunday (Easter) since Saturday I will be at the theater watching the simulcast of the Met's Manon which I have never seen. I am looking forward to it. I haven't bothered to take a photo of the Decoration Day sweater. I finished the first sleeve and am half way finished with the second. I hope to finish it up during the weekend and get started on the front bands. Then on to the cable sweater in Vlad. I can't believe no one has commented on this post. This just created my AHA! moment. 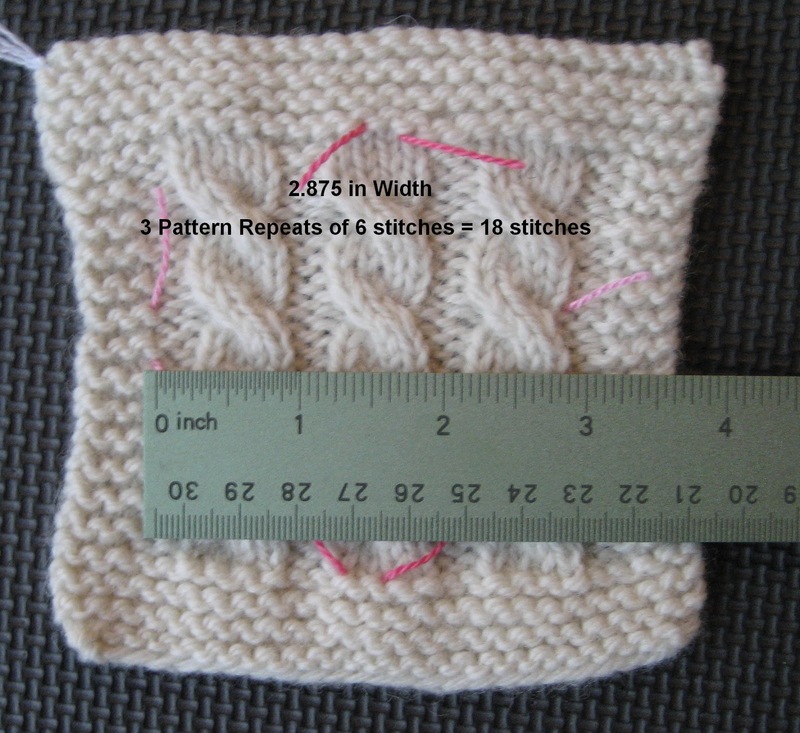 Thank you Arenda for another fabulous knitting explanation. I have struggled with this gauge thing for so long and now I finally get it. This is a very helpful post regarding gauge. Thank you! I marked my swatches following this blog post for Master's Level 1, and my co-chair commented that one of the stitch markers on the cable swatch is in the middle of a stitch, not between stitches -- you can see it on the wrong side in the bottom-most picture of the cable swatch (marker on the left). This was the best explanation for counting for gauge swatches I have seen. 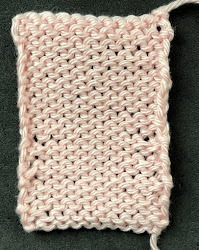 Tried to take a class while in the US but wasn't able to work it in and I'm completely a self-taught knitter so I was really having trouble with this. Thank you so very much for this clear and detailed description. Now to see if I can print it for my reference notebook!